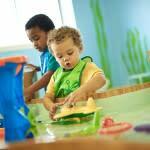 What makes Impression 5 Science Center so cool? These five things that are happening in February, plus so much more. Find Impression 5 in the heart of downtown Lansing with plenty of free parking! This– Presidents’ Day!!! Impression 5 will be open this coming Monday, February 15th for Presidents’ Day from 10:00 a.m. to 5:00 p.m. Woot! Let’s have some FUN!!! This– TRAINS!!! With over 480 feet of track, the Capital Area Railway Society’s intricate and meticulously accurate Trains exhibit is one of the great kid-friendly attractions in Michigan that delights children and adults alike. It’s hard to tell who’s enjoying it more, Grandpa or little Johnny. The Trains!!! exhibit is open now through February 21. Get a move on! And this– Physics and Astronomy Day!!! Get your out-of-this-world day of physics and astronomy exploration on Saturday, February 20 with tons of new themed hands-on activities. Explore the night sky inside Abrams Planetarium’s inflatable planetarium, play with non-Newtonian fluids, and smash atoms like MSU’s particle accelerator! It’s going to be one stellar adventure! 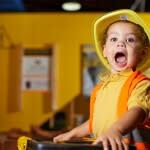 Regular admission applies to these kid-friendly attractions in Michigan. 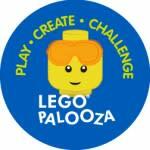 And especially this– LEGO®Palooza!!! This annual LEGO®Palooza event takes over the Science Center for the February 27/28 weekend with tons of special LEGO-themed activities, challenges, and more kid-friendly attractions in Michigan. Let your imagination take form on the 3D LEGO wall, create your own masterpieces in the free-build area, test your engineering skills to build the fastest car or most stable boat, or be a part of an awesome photo-op! Listen up. This event is highly recommended, so register now. Call (517) 485-8116, x132 or go online. And this is all year long– The First Impression Room!!! Proving that you are never too old OR too young for Impression 5, you’ve got to see the First Impression Room. It’s a space for young scientists ages birth to four years to experience and learn about science in a comfortable and creative environment. Find family restrooms, private nursing rooms, crocs and raincoats for the water area, and a welcome area for enjoying snacks and more! This is a relatively new area and it’s one of the kid-friendly attractions in Michigan that is perfect for the littlest learners.